Flush earnings still help, but higher interest rates and trade concerns hurt the bull case for stocks. Not much happens when businesses, investors, and consumers decide to pull in their horns. Fortunately, the past couple of years have had most people feeling relatively optimistic about the outlook. Consumers are benefitting from full employment, rising wages, and increased wealth. Business owners and investors are reaping the benefits from a growing economy and large profits. For the past several years, no attractive “risk free” investment alternative existed to compete against riskier assets. One way to think about compensation for risk taking is the “excess return” that can be earned over holding what is often referred to as a “risk-free” asset like Treasury bills instead. Of course, knowing in advance the stock market’s return is impossible and no investment is without risk. However, we can look for some proxy of profitability and value to provide a reference point. One such reference point is the forward-looking earnings yield for the S&P 500. The chart below shows that yield which is calculated by dividing the 12-month forward analyst earnings estimates for the S&P 500 by the S&P 500 index itself. Strong earnings and/or better valuations will raise the earnings yield (making stocks more attractive), while weak earnings and high valuations reduce the earnings yield (making stocks less attractive), all else being equal. 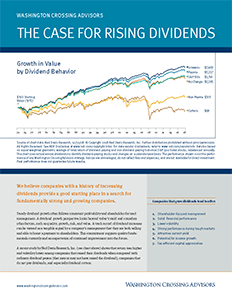 As one last step, we should look at the earnings yield versus the risk-free alternative to assess the relative attractiveness of stocks versus holding cash or another safe asset . 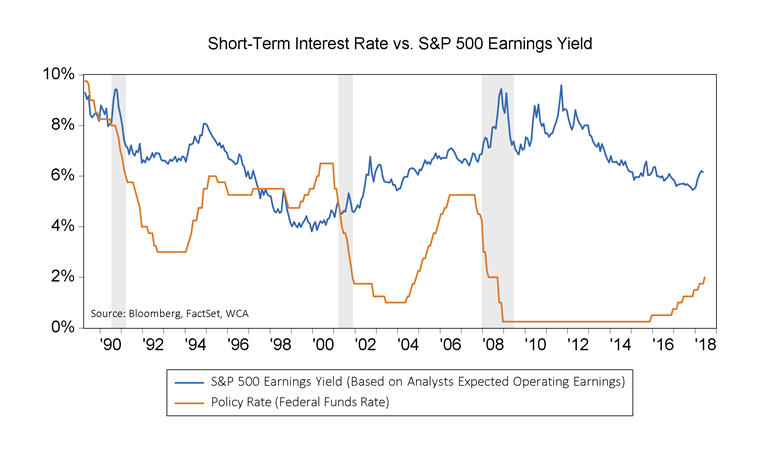 A casual look at the chart above shows that today’s earnings yield remains relatively attractive compared to the short-term Treasury rate. However, it is clear that the Federal Reserve’s (FED) rate increases of the last year are starting to reduce that advantage somewhat. If, at some point, the differential between the risk free rate and the earnings yield becomes too small, then markets could decide to reallocate capital away from risk-oriented investments. For now, there still seems to be a significant gap between the short-term “risk-free” rate and the earnings yield on stocks. This was the case back in the early 1990s, early 2000s, and 2007-2008. The good economic environment and the situation just described creates an excellent environment for the stock market. The last two years saw improved growth, rising earnings forecasts, and a benign inflation and policy backdrop. We are closely watching fundamental conditions evolve since last year, however. Our own WCA Fundamental Conditions index, which tracks a host of inputs relating to markets and the economy, peaked early in the year and has drifted lower ever since. 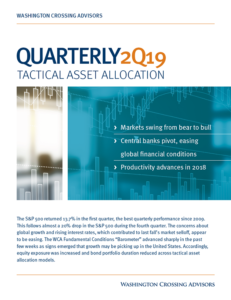 We have steadily cut risk exposure on a tactical basis as the result of the slippage in tactically invested asset allocation portfolios. At the same time our barometer has been fading, a U.S. led effort to renegotiate trade deals is leading to a heating up of global rhetoric on a wide variety of trade issues. While we will stop short of laying the slippage in our barometer at the feet of a trade dispute, we cannot dismiss the possibility of a connection either. Although there has been relatively little actual impact on trade yet, the atmosphere has clearly been tainted by a constant stream of headlines that points toward growing uncertainty surrounding the future of global trade. We are especially interested in seeing how businesses respond to the changing landscape, because this has a direct link into investment and hiring plans in the real economy. In the next several weeks, we will look to highlight business and manufacturing surveys as key to tracking how capital investment and hiring plans are evolving in light of the newly developing narrative on trade. On June 15, we reduced equity exposure and raised core bond exposure in satellite portion of portfolios. Tactical tilts in the core include an overweight to value vs. growth, underweight emerging markets vs. developed, underweight gold vs. REITs.